Clare Mulley has written a fascinating biography about two fascinating women. You would have thought that two women who grew up in post-World War One Germany with a love for flying and an intense urge to succeed in becoming pilots, would have been allies, even friends. Instead, Hanna Reitsch and Melitta von Stauffenberg (nee Schiller) became bitter rivals. This was not just a competition between the two darlings of German aviation. The two women had fundamentally different ideologies and beliefs, and their lives went down two very different paths. As children, both Hanna Reitsch and Melitta Schiller longed to fly. Hanna would jump off tall trees, Melitta idolised the World War One pilots. After the Versailles agreement banned Germany from developing new military planes, Germany became obsessed with gliding, and this was the first path to flight for both women. Both joined gliding clubs and progressed to planes. Both were skilled pilots with natural skill and a lack of fear, and they were soon noticed by those outside the flying world. Hitler took a personal interest in them both. Both women became symbols of a brave new Germany, being featured in magazines and newsreels. Hanna revelled in the publicity, promoting not only herself, but Hitler and the Nazi regime. Melitta preferred to work away from the limelight at the German Research Institute for Aeronautics. Hanna, blonde and blue-eyed, was a perfect example of Aryan women. She was devoted to Germany, the Nazi Party and Hitler. She was determined to fight for Germany, even though she was not allowed to serve in the Luftwaffe. Instead she worked to test new planes, including gliders and helicopters, and advising, cajoling and even warning Goering and Hitler. Melitta’s father had Jewish blood, though he had been baptised as a Christian. She was married to Alexander von Stauffenberg, whose brother, Claus, led the notorious Operation Valkyrie – an attempt to assassinate Hitler. Aware that she was tainted by her Jewish blood, and her opposition to Hitler, Melitta spent the war making herself invaluable through her work. She became a test pilot for dive bombers, thinking of her work as a way of saving German lives by making the planes safer. Both women were given the Iron Cross. And yet both women ended the war in very different places. 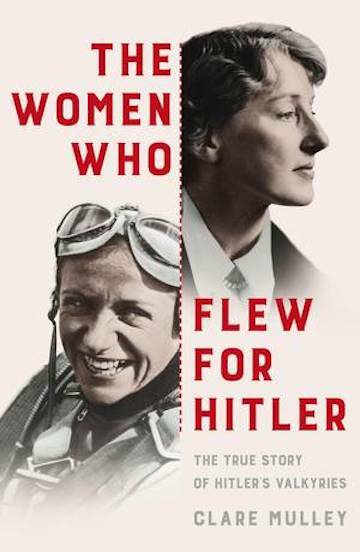 The Women Who Flew For Hitler is an utterly compelling read. Mulley brings both women to life, so we feel we know Hanna and Melitta. Mulley manages to explore their characters and the technical aspects of the work they did, telling the stories of both women alternately, so we can place Hanna side by side with Melitta and compare their beliefs, their lives, their loves and their achievements. At times, the story is an exciting as any war film and I was gripping the book tightly, desperate to know what happened next. At other times it was intensely heartbreaking. And yet Mulley also manages to express the joy and freedom both women felt in flying. Mulley doesn’t just tell us of the women themselves, but the people around them, who they were, what they thought. Their friends and colleagues and enemies were the important people of the time, and there are new insights into familiar names throughout this book. I was especially interested in the way Hanna interacted with Hitler, and how he felt about her. Mulley has carried out an immense amount of research, and it shows. Each page is full of facts, yet the reader is never overwhelmed and never loses sight of Melitta and Hanna. The Women Who Flew for Hitler is a thrilling, moving insight into two very different, but equally amazing women. Michelle Birkby is the author of The House at Baker Street, the first in a series written from the point of view of Sherlock Holmes’ housekeeper, Mrs Hudson, that follows Mrs Hudson and Dr Watson’s wife, Mary, as they team up together to do some detective work of their own. The second in the series, The Women of Baker Street, is out now. Read about Michelle’s Desert Island Books here.